When notified of the award, Ettrich at first thought it was spam, reports Mirko Boehm at kde.org. Yet he did not receive the honor for founding KDE in 1996 only, but also for his engagement in free software in general. In his acceptance speech, he had just one question, ''So, now what is next?''. 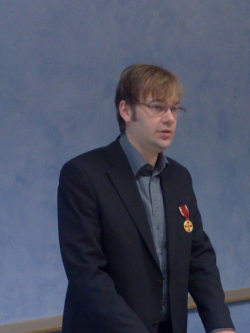 Ettrich was awarded the medal by state secretary Almuth Nehring-Venus, who noted that not only is Ettrich one of the youngest recipients of the prestigious award, but it was the first ceremony where the award-winner's young children were also present. We congratulate Matthias on his award and hope he will carry on with his innovative work in free software for a long time to come.